Do you want to show your recent posts in WordPress? Displaying recent posts helps your users find them easily. You can add recent posts in your sidebar, after the end of your post content, inside your post content with a shortcode, in your footer widget areas, and basically anywhere else that you like. In this article, we will show you how to display recent posts in WordPress with a plugin, widget, shortcode, and the manual method with the recent post function. WordPress comes with a built-in default widget to display recent posts in your site’s sidebar or any widget ready area. Inside your WordPress admin, simply visit Appearance » Widgets and add Recent Posts widget to a sidebar. The built-in recent posts widget is very basic. You can provide an alternate title to the widget, show date, and add the number of posts you want to display. Next, click on the save button to store your widget settings. As you noticed that the built-in widget we mentioned above is quite limited, and it doesn’t even allow you to show thumbnails or excerpts which is often a priority for users. What if you wanted to display thumbnails and excerpts with your recent posts? What if you wanted to limit them to specific categories or tags? Well, that’s when Recent Posts Widget Extended plugin comes in handy. First thing you need to do is install and activate the WordPress Recent Posts Widget Extended plugin. Upon activation, simply visit Appearance » Widgets and add Recent Posts Extended widget to a sidebar. Recent Posts Extended widget comes with a lot options and gives you full control on how you want to display recent posts on your WordPress site. You can show thumbnails, excerpts, limit categories and tags, ignore sticky posts, and much more. 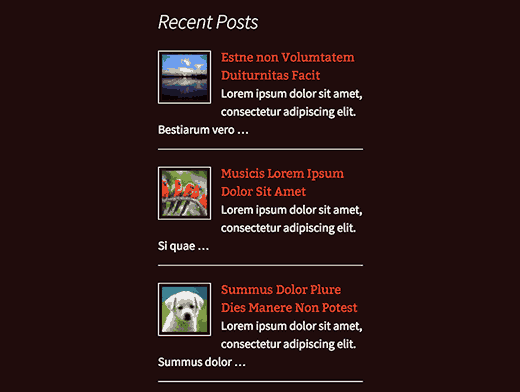 You can even use the widget to display recent posts from any other post type on your site. Adding recent posts to a sidebar is fairly easy, but what if you wanted to show recent posts inside a WordPress post or page? 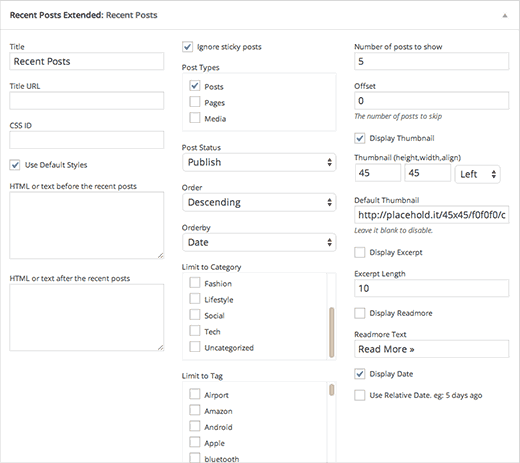 The easiest way to display recent posts in WordPress posts and pages is by using shortcodes. First thing you need to do is install and activate the Display Posts Shortcode plugin. It works out of the box and there are no settings for you to configure. Change the order to title instead of date. Display recent pages under a specific parent page. For a full list of parameters visit the plugin’s documentation. You can also use these shortcodes inside a text widget, but first you will need to enable shortcodes in your text widgets by adding this code to your theme’s functions.php file or a site specific plugin. More advanced WordPress users may want to add recent posts directly in their WordPress theme files. There are multiple ways to do this, but the easiest one is to use the built-in WP_Query class. Simply add this code where you want to display the recent posts. This code simply displays five most recent posts with their title and excerpt. The WP_Query class has tons of parameters that allows you to customize it any way that you like. For more information please refer to the codex. 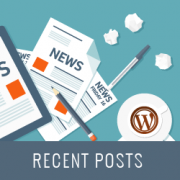 We hope that this article helped you learn how to display recent posts in WordPress. If you want to customize the display of your recent posts without writing any code, then you may want to check out CSS Hero, a WordPress plugin that helps make design customization easy – see our full CSS Hero review. thank you so much. this helped me a lot. thank you thank you :). When I tried to edit the page that’s supposed to display blog posts, the editor disappears wit this notice: “You are currently editing the page that shows your latest posts”. Does anyone have this same problem as me? The Blog page is automatically generated by your theme so you will not have the option to edit it directly unless you have a theme specific setting to edit it. HI…..i just started using WP and i need some help! i want to publish articles from 3 different categories to 3 different pages.how can i make a page point to an article category? Is there a way to customize the way post titles are displayed? I don’t want to display the full title of the post or page, just the keywords… much like you shorten the slug for your url. Actually this is exactly what I’m looking for, to display the slug as a link, and not the entire page title. Ideas? Great article, When I use the Recent post widget and set it to only display a category my sticky posts do not work. Have you encountered this before or know of a solution? Hi, thanks for this complete article. I have a doubt, if I have my wordpress integrated with Magento, can I use magento within the short code to put the last entries in my magento house? and another section under this designed differently for the latest posts that range from 2-5. (The 2nd, 3rd, 4th and 5th post). What is the shortcode php for this to add to my theme template. I’m noticing that the spacing in between the posts is cutting off the titles and it makes the page look sloppy. What code can I add to add a little space after each post preview? You can adjust spacing between posts using CSS. Love the idea, the only thing I don’t like is the display. So it’s great how it has the thumbnail, title, excerpt, etc but the way the title and excerpt are positioned…I think they should be inline with the thumbnail, not at the bottom of it…it looks awkward and unappealing…any way to make it inline? How to display recently post in a post on phone version? If I am using 2 database. 1 for main site and 2nd for blog then how to add recent post on home page ? Hi, I put [display-posts posts_per_page=”5″ post_type=”page”] on my post, but not working, can you help how to find the problem? Great writeup. I want to display the recent post on a page. awahere am I suppose to paste the code? gereat … thanks a lot . How to show thumbnail of 1st post bigger and others smaller…..
You could perhaps use :first-child CSS to do this. Thank you for this post. Really helped a lot. But then I have a problem. When I click on one of the recent posts – it directed me to the static page and not the post itself. Kindly help me resolved this issue. Thank you. I’m confused – I can’t seem to get my most recent blog post to appear on my blog page. Can you advise please? Thank you so much! How do I get the selected post to display? Are links to the recent posts widget dofollow links? Hi Val, Hope your doing well, I was just scrolling through this article and saw your name and thought straight away I know that name! It’s a small world. I made one of your sprouters in the late 90’s I think it would have been. Funny thing is I was just thinking about building another one a few days ago! Crazy how things happen sometimes! Weird that I then just stumbled across your comment on here today in 2018 while I’m working on my website for something totally unrelated. I remember I really enjoyed reading about your life and the move to Sth Africa, your cures for tooth aces etc. I’ll have to have another look into it all again soon when I have time, anyway just thought I’d say Hi. Hello, I used the same shortcut in my site but it not show my recent posts at all, what is the probelm? This article shows several ways to display recent posts, which one you tried on your website? Hey, how to display recent posts from another wordpress site? You can fetch them using RSS feed. Please see, how to fetch feeds in WordPress. On my recent posts on the sidebar, when I click a specific post it brings me to the latest post and then displays everything. How do I get it so that when I click a specific post it only shows that post? Is there a code I can add to activate pagination using the Recent Posts Extended widget? Currently I have my home page widgetized so I’m using the widget. Please let me know if it’s posible to show the post list in dropdown? Hi! Great plugin, thank you! Is it possible to have the author listed, instead of the post name? Hi I am new on wordpress, I want to show Client Testimonial using post….How should I do it..? any suggestions please ? Here is an easier way. Install Display Posts Shortcode plugin. Create a blank page and add the shortcode as described in plugins documentation. Publish the page. Go to Settings > Reading and select the page you just created as your static page. Redit the static page and add the slider just before the display posts shortcode. Hope this helps you. Please see our guide on How to customize WordPress excerpts (no coding required). Hi, I am wanting to add a slider to the top of my homepage, but it will only allow me to do so if I use a static page. Right now when you go directly to my website, it is my latest posts in full length. If I change my homepage to a static page so that I can include the slider, will this work to add the recent posts below, just as it appears now? Where would I be posting this code? Into the static homepage? Note– I recently tried messing with my php and broke my code and had some major issues.. so I’m pretty nervous messing with php. hi!…can anyone tell me how to display top rated blog posts (only 5) in increasing order (numeric order) by using PHP codes? Hi there. I am a designer so I’ve never been good at PHP. At least I can read and change it for my conditions most of the time. This time I’d like to call for the nine latest posts excluding the very last one inside my slideshow container. For now I just set the first post on display none. This works fine; however the slideshow still counts to ten. That’s why you find the last page empty. Is there any way to exclude the very last post when calling for recent posts? Thank you so much in advance! Hi, I want to display blog posts only from a category called ‘Blog’ only. (I want to exclude all other posts from other categories.) What should I add to this code.? showposts is deprecated. However, posts_per_page is perfect for use with query_posts(), or even more particularly, WP_Query::query(). numberposts may be the equivalent argument for get_posts(). This worked perfect! Thanks a lot to the author of this article. The link to Limit-Post Plugin doesnt work!? Thanks for notifying us. We have updated the article with a new code snippet that does not require you to install any plugins. Hope this helps. One piece of info that would increase it’s usefulness though, is how to (or a plugin that can) include an offset. For example, I want my two most recent posts to be full text — got that. But what if I want the next 10 to be excerpts, and maybe the next 10 older to be headlines only — the list? So — how can you include an offset? I want my latest 4 posts to display inline across the screen, how would I do this? Currently they only display down the page. 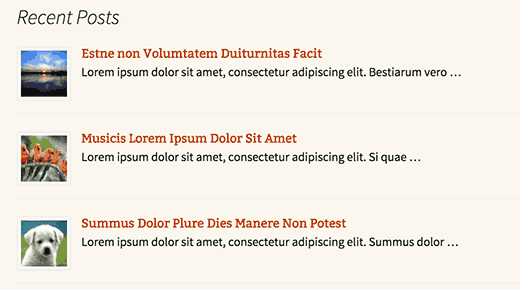 Sounds like you need to create a container with the height/width you want the posts to appear as. Then allow them to wrap over.. make sure that the last piece of your “Post” code doesn’t have a line break. Just one question. Is it possible to hide the latest post out of 5? I mean on my website I display the latest post already with full content, so I would like to hide the first. Where do I input the code to change the number of full posts displayed? Lovely! Is there a way to make the headers of each post H2 ? And, can I hide a category? Yes use the second method and wrap it around h2. Use wp_query codex page to look at the parameter for hiding categories. I use the WordPress Twenty-Eleven theme and have always displayed recent posts using the widget in Jetpack. But I want this list to show in the individual posts as well. Is there a way to do this? If it involves pasting code, into which file do I paste? Where in the individual posts do you want to show that list? Below post? Sidebar? The home page of AWildDuck -d0t- com, shows recent posts along the right side, along with subscribe and a tag cloud. But this appears only on the home page. If I send you a link to any individual post (or if you click on the title of any post), the right frame disappears. My visitors can no longer see a list of recent posts. I am very frustrated by this, and I want to know how to get that list of recent posts to appear on all pages. (Not just the home page). Go to Appearance > Theme Options. Change the default Layout to content on left. Indeed, this is my current setting. It has always been my setting. Twenty Eleven with “Content on left”. Hmm that’s weird because that’s what I have and it is working fine. I don’t understand… Do you see Recent Posts on the right, even when you are looking at an individual post? If you do, are you using JetPack/Recent Posts? If the answer to both questions is “Yes”, would you please send me your phone number. You already have my email address. -Or call me: Area code “Five-Oh-EIght”, 485 ..695O. Thank you and with the_post_thumbnail ? Simply add the_post_thumbnail(); and style it however you like. thank you, yes, but I ask not only for me but thinking of other visitors, it can be more useful in your article, give an example of recent articles with thumbnails. Thanks so much for this tutorial! I used the code to display recent posts with a summary on my website’s homepage. When adding the_post_thumbnail(); code could you please tell me what file and where in the file to add it? I tried looking it up and experimented by adding it to several files on my own and was not able to get the thumbnails to show up. In your Post Edit area, post thumbnails are called featured image. If you can not see a featured image meta box, then click on Screen Options button on the top right corner of your post edit screen and check Featured image. Get 20% off on Themify theme's beautiful WordPress themes. Responsive designs with tons of options.